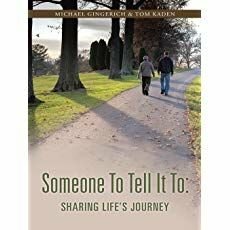 In 2012, two ministers in Pennsylvania stepped away from traditional church work to form a remarkable non-profit called Someone To Tell It To. 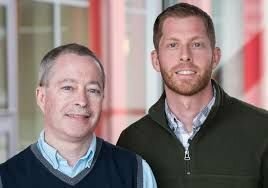 The mission of Michael Gingerich and Tom Kaden was as radical as it was simple: They would be there to listen—in person, on the telephone, via email or Skype—to anyone who needed a loving, attentive, non-judgmental ear. They would listen to people who wanted to share about anything at all, free of charge. I met them a few months after their journey began. Much of their inspiration had come from Fred Rogers and the two had found meaning in the memoir of my friendship with Fred, I’m Proud of You. From our first telephone conversation, it was obvious that the three of us shared a belief that one of humankind’s greatest afflictions is not the inevitable suffering of life, but isolation and loneliness and the shame of believing that we are the only ones who struggle. Seven years later, not only are they still upright, but Someone To Tell It To thrives and is growing, with fifteen other trained compassionate listeners. Prestigious people from across Pennsylvania have been inspired to serve on the board of directors. STTIT has been endorsed by prominent authors in their field and Tom and Michael have published two compelling books of their own. They have conducted listening seminars for hundreds of hospice workers, teachers and business people. Last year they were invited to speak at the annual meeting of the International Listening Association in Dublin Ireland. 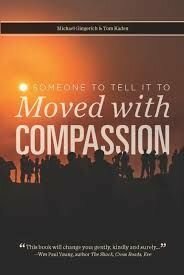 To date, Someone To Tell It To has engaged in compassionate listening on over ten thousand occasions with people around the world. In the vast majority of cases, Tom and Michael have been the listeners. And this week they launch a podcast. I’m deeply humbled they chose me to be their first guest. Click here to listen. I’ve long believed that my friends, with people like Fred Rogers and the Catholic writer Henri Nouwen, are on the cutting edge of a great human movement, part of our evolution as a species. Gradually more and more of us have come to know that suffering is not a defect of character but a universal part of the human condition, part of shared humanity—and that we need not suffer alone. We all want and need to be heard, to know that others listen and care. We crave intimacy. We are in a constant search for validation and for our voices to find resonance with the lives of others…We have seen this need again and again during our years—visiting people who have been homebound or in hospital rooms, or as we’ve sat with someone grieving the death of a loved one, or comforted those in distress, pain, loneliness or uncertainty. We have also experienced this need firsthand as we have grappled with our own families’ challenges with cancer, financial pressures, career directions and disability. We have learned how all of us at times vitally need to be heard. We need someone to listen so our struggles and our questions are shared and not ours alone to bear. That’s why the impact of Tom and Michael and their organization will grow in the coming years, exponentially, in my mind. The need for the human connection that they provide is so vast. They—and we—have only begun.